El Paso Valley in Texas has a history of irrigation dating back to the 1800s, ultimately leading to the creation of the El Paso County Water Improvement District headquartered in Clint. The district provides water and controls runoff for 69,000 acres of land in the vicinity of the Rio Grande River. Water is delivered via 360 miles of canals and laterals to more than 2,205 turnouts, irrigating crops of cotton, alfalfa, pecans, wheat, vegetables and more. To keep up the supply of water and to maintain proper drainage, the district needs equipment that is mobile enough to work throughout the canal system and versatile enough to handle many different maintenance jobs. 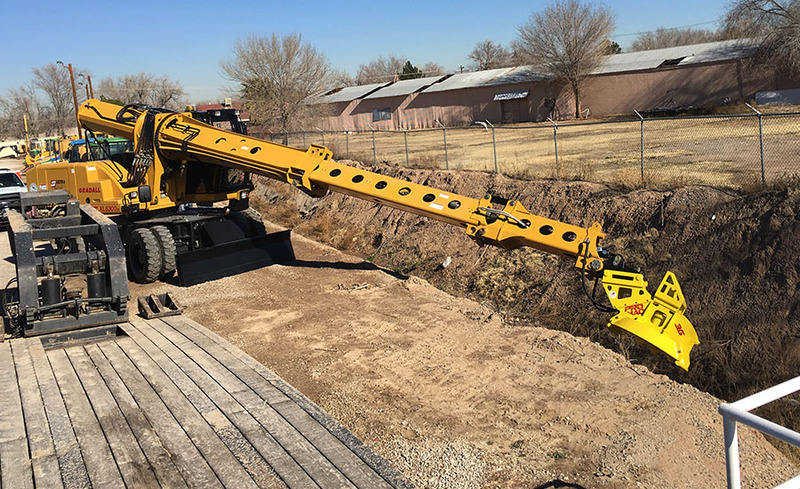 "We're using a Gradall XL 5300 III for one of our primary jobs - clearing and mulching trees and brush in drainage canals," said Pete Rodriguez, maintenance manager for the district. "With our Gradall and a six-foot boom extension, we can reach down 15 to 20 feet along the banks and into the center of the canals." Rodriguez says the entire process involves equipping the XL 5300 with a mulcher, a 72-inch ditching bucket and a rotary mower. 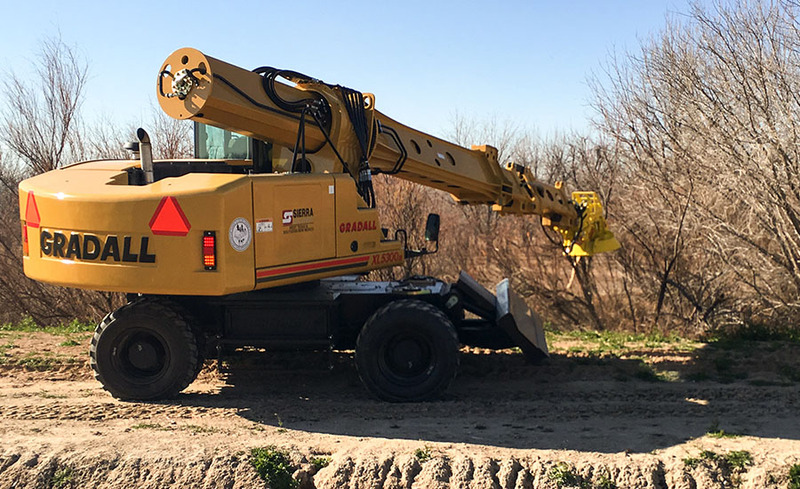 "The telescoping and tilting Gradall boom gets us the exact attachment placement we need for greater productivity," he said, noting that properly positioned, the mulcher can dispose of trees up to eight inches in diameter. Full boom tilting action also allows the operator to position the mower at an angle that matches the slope of the banks, removing vegetation but leaving roots in place to prevent erosion. The resulting mulch is spread on the bank, eliminating the need for cleanup, loading or hauling material. Proper mower positioning also allows the operator to control flying cuttings, directing them away from private properties and roadways. The XL 5300 III model has a rough terrain wheeled undercarriage that moves easily over pavement or vegetation at speeds up to 15 mph. "The mobility is very good, and the upperstructure is well balanced for steadiness, even with the optional blade and outriggers raised," said Rodriguez. 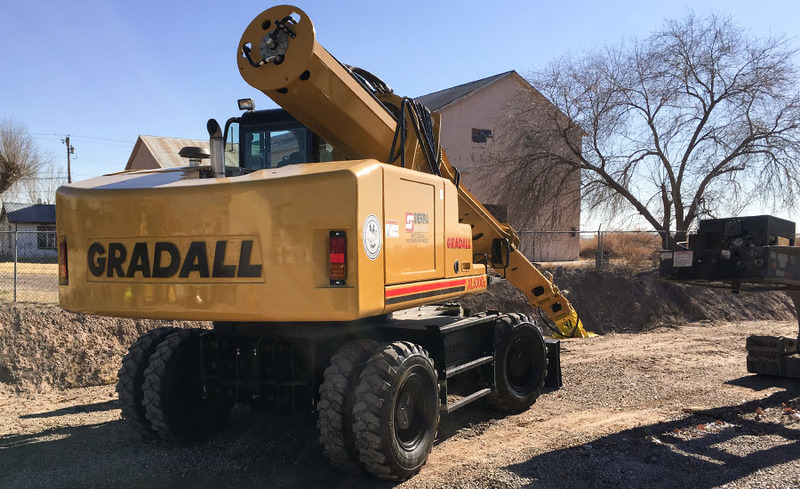 "Gradall's attachment bracket lets us make changes very quickly, so we can handle a lot of different jobs with one machine. We think that makes Gradall the equivalent of a heavy equipment Swiss Army Knife." Choose from the drop downs to display our extensive list of Gradall job stories.